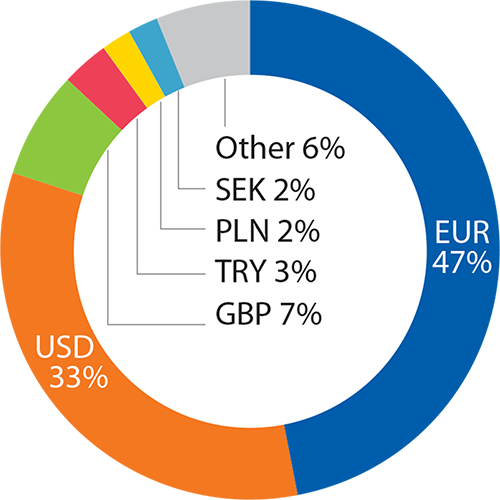 The Bank issued bonds in 15 currencies, with the majority raised in the core currencies EUR, USD and GBP. Diversified sources and tenors give flexibility to the Bank’s funding strategy. The multicurrency approach also enables the EIB to access some local currencies for disbursements. EIB officials visited China last year to reinforce the Bank’s support for climate projects there. The EIB expects to approve lending to many climate projects across China in urban transport, forestry and energy efficiency. The EU bank and the Chinese Central Bank also agreed to work towards a shared framework for green bonds and to make it clearer which projects qualify. The two sides hope that a common language will lift the confidence of Chinese and international investors. The importance of this work was highlighted by the EU-China summit in Brussels in June, when officials underlined a joint commitment in the fight against climate change. While cooperating on green bonds with the China Green Finance Committee, the EIB has contributed to what is known as the High-Level Expert Group on Sustainable Finance, a forum created by the European Commission to advise on how to promote sustainability in EU policy. If green bonds are flying high now, it wasn’t always clear they’d take off. Romani remembers the difficult days in his office a decade ago. Fixing climate change was becoming a hot topic in Europe, but few people thought the idea for a green bond could be one of the solutions. Many experts believed it would be too hard or controversial to monitor and confirm that the money raised from these bonds was actually spent to help the environment. “Nobody had confidence in the endurance of green bonds in 2007 and people were wondering why the EIB was the only one talking about it,” says Romani, a manager in euro funding at the EIB. Today, as the EIB celebrates the eleventh anniversary of its first green bonds, this market is one of the biggest success stories in climate finance.